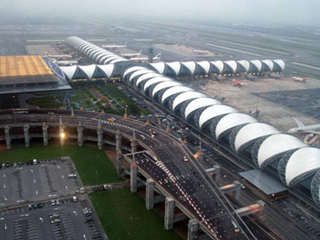 The Thai cabinet has passed a draft law to protect all international airports in Thailand from intruders. The law will give full authority to the transport minister and the Airports of Thailand's security officials to disperse any trespassers. The draft law carries a maximum penalty of 10,000 baht and a minimum penalty of 500 baht. The closure of both of Bangkok's international airports in November and December last year has dealt a devastating blow to the country's reputation, its tourism sector and its export industry. The Thai cabinet has passed the draft law to protect all international airports in Thailand from intruders. The law will give full authority to the transport minister and the Airports of Thailand's security officials to disperse any trespassers. The closure of both of Bangkok's international airports in November and December last year has dealt a devastating blow to the country's reputation, its tourism sector and its export industry. The draft law carries a maximum penalty of just 10,000 baht and a minimum penalty of 500 baht.